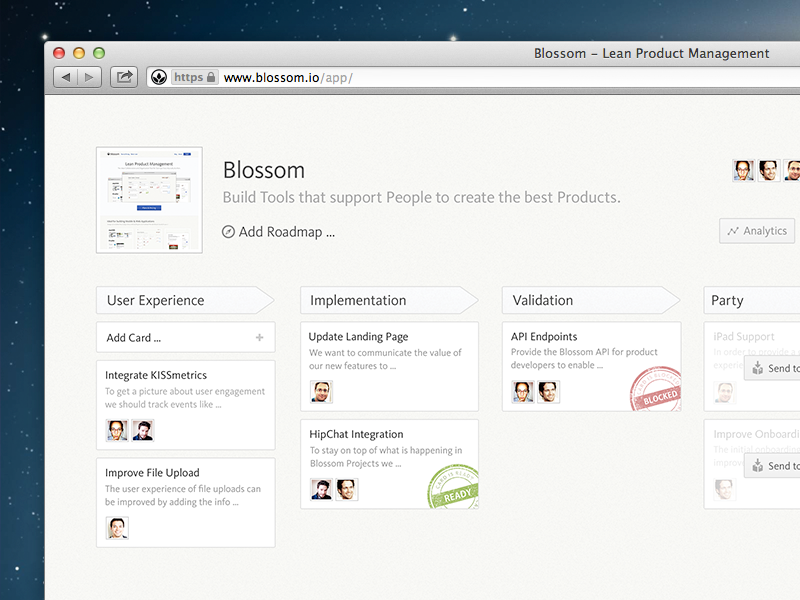 On the surface Blossom is a very lightweight Kanban board. You can define your own stages to ideally map your team's workflow. Blossom shows you who is doing what and how far features are in your process and you can also add optional WiP (Work in Process) limits per stage. But the real magic happens once you connect Blossom to GitHub. No one enjoys spending unnecessary time in their project management tool. We all prefer to focus on the fun part. Building great software. That's what we love. So we designed our integration with GitHub in a way that you don't have to manually update and replicate your activity in Blossom. You can focus on coding and getting stuff done without having to send annoying progress updates. When you work on implementing features it can get really annoying when you have to manually reference the card you are working on with every Git commit you make. Blossom really gets out of your way here. You can link the feature branches you are working on to a card in Blossom and you will automatically get updates inside of Blossom without manually referencing which card you are working on in every commit. This way you can just focus on whatever you are currently working on. Another situation where Blossom gets out of your way is when you hit a blocker. Let's say you are working on your integration of a payment processor. Suddenly you find out that the API you want to use is not behaving like it is documented. 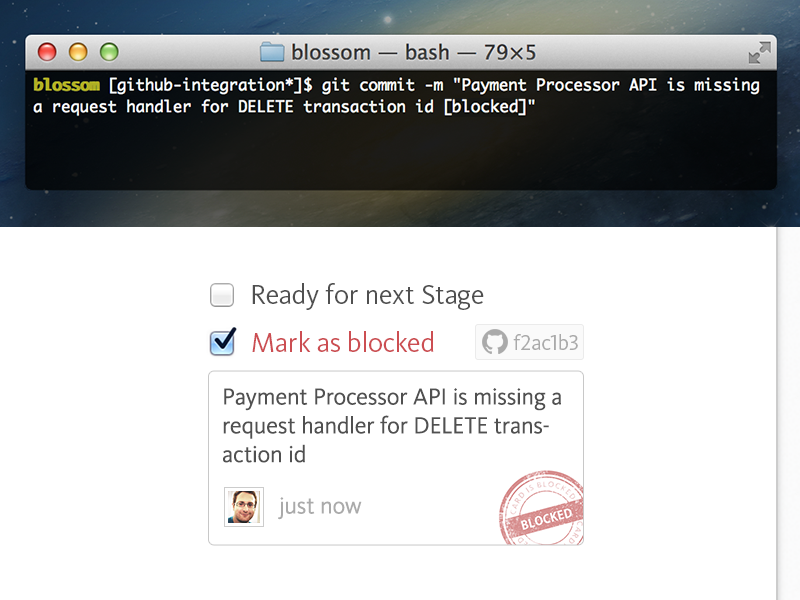 You can just mention in a commit message that you are blocked and because Blossom knows that the branch you are currently on is related to the card of integrating the payment processor it will automagically mark it as blocked for you and add a reference to your specific commit. No need to ever get out of your current workflow. You can stay in your code base, no need to even log in to Blossom. Yet everyone who needs to know about the blocker gets notified. Blockers are among the most expensive situations in your software development process. Having a no-friction way to let the right people know about it and provide instant context is super important. If you encounter a blocker (see above) Blossom will not only automatically mark the card you are working on as blocked and reference your commit, Blossom will also push that information to your team's group chat tool. We currently support HipChat, Flowdock as well as Slack. 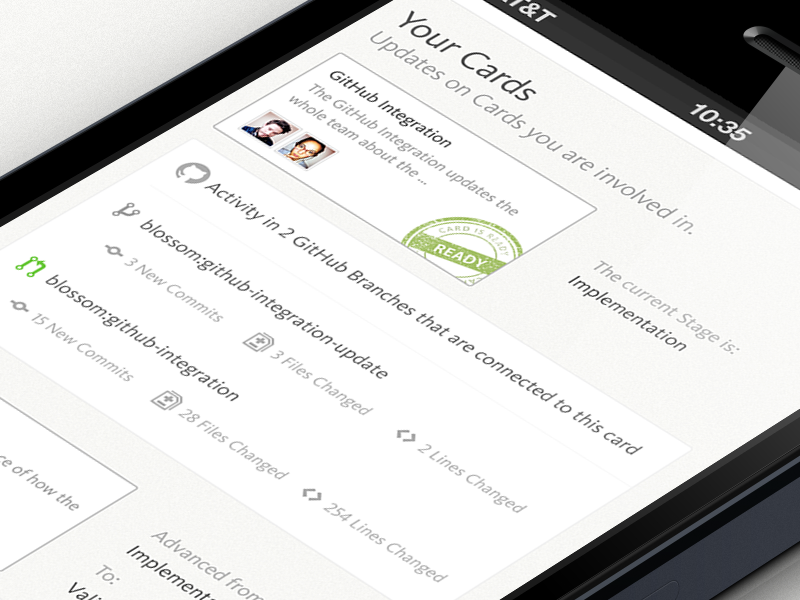 If you want to you can even close checklist items of a card using commit messages. The great thing here is that Blossom will automatically add a reference to your commit on GitHub and show it inline next to the checklist item you just completed. 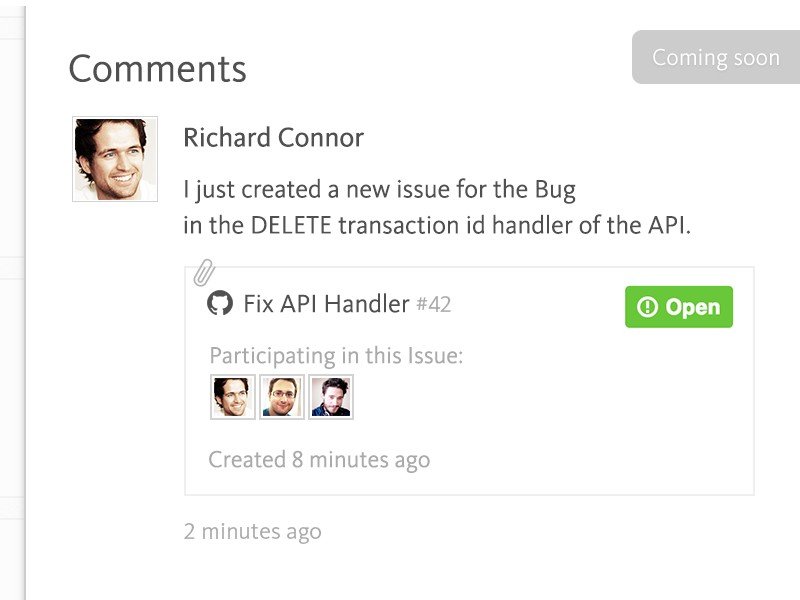 Also when you hover over the reference you will see a tooltip with the meta information of your commit. Again, no context switching needed. Whether you are a distributed team or just getting ready for a stand-up meeting Blossom's daily email digests are a great way to stay up to date with what’s going on. 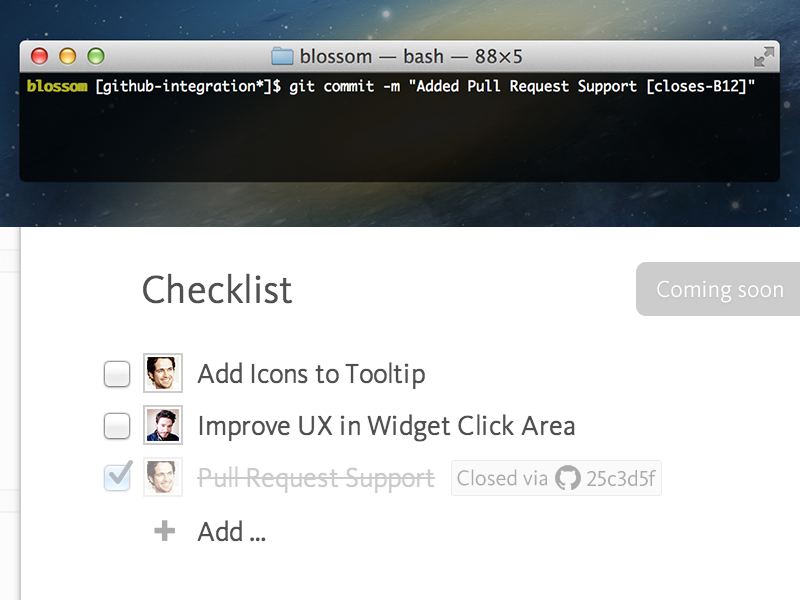 Because most of your work happens in your code base and not in your project management tool Blossom automatically list your GitHub activity and development progress your daily digests. This happens even if you forgot to log in to Blossom because you were deep in your code base. No manual updates needed. No email reports to send about your progress. Blossom has you covered. Often implementations you are working on are related to GitHub issues. Whether it is about Issues of your own GitHub projects or if you just want to reference a known bug of an open source library. That’s why it was very important to us that referencing GitHub Issues is as easy as pasting a link into a comment. 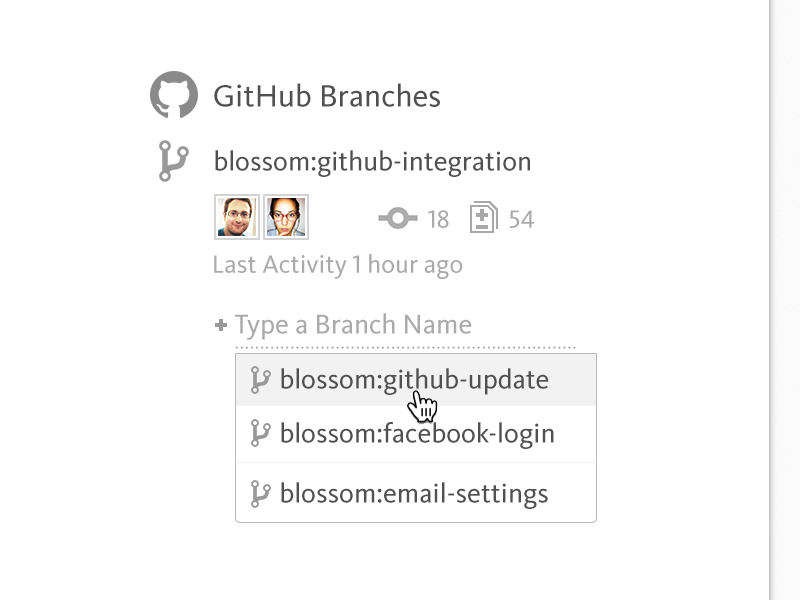 Once you’ve referenced a GitHub Issue in Blossom we will display a brief summary of it and automatically notify you about important changes. Pull Requests are extremely important events in the lifecycle of a card. Whenever a Pull Request is opened in GitHub it means that a significant chunk of work got completed and is ready to be reviewed. 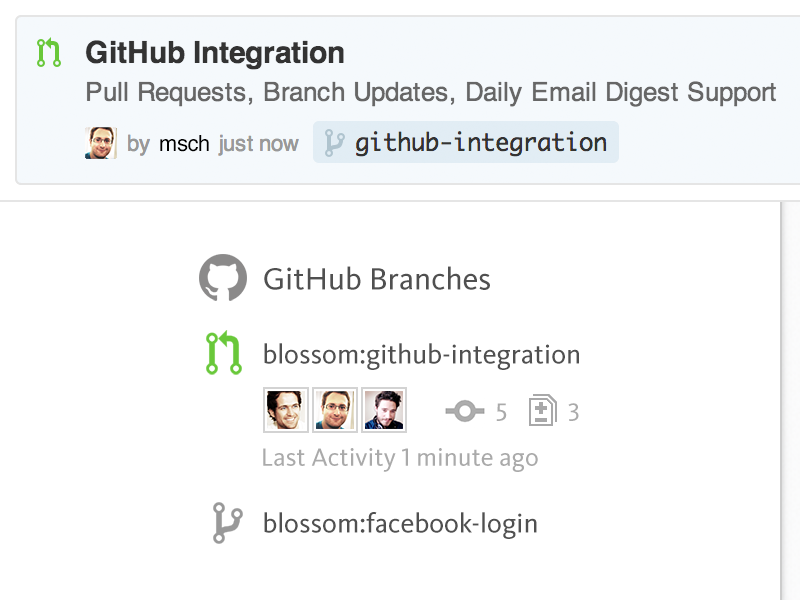 Blossom understands the current status of Pull Requests & makes it super easy to see what’s going on. You are just one click away to view the diff and start your code review. Keeping everyone up to date on progress & potential blockers is hard, especially when it comes to what’s going on in your code base. This is why we’ve built an incredibly tight integration with GitHub. You don’t have to change your current workflow. Blossom just magically understands things like GitHub issues, feature branches & pull requests and shows you what you need to know.